HANOI/SEOUL (Reuters) - In 1966, Ahn Hak-soo was one of more than 300,000 South Korean soldiers fighting alongside U.S. forces during the Vietnam War when he was captured by the North Vietnamese army and handed over to Hanoi's key ally, North Korea. North Korea, having fought the U.S.-backed South to a standstill in another brutal Cold War conflict a decade earlier, used Ahn in propaganda broadcasts, but he was never seen by his family again. Now, relations between Vietnam, South Korea and the United States are cosy and economic ties are crucial. North Korea remains isolated and impoverished. The upcoming summit between U.S President Donald Trump and North Korean leader Kim Jong Un in the Vietnamese capital represents a new chapter the countries' complex relations, but is also a painful reminder for some. "Looking at what is happening in Hanoi now, I really feel the irony of history," Ahn's brother, Ahn Yong-soo, told Reuters. Vietnam and North Korea were close allies during the Cold War era, sharing similar socialist ideologies and exchanging military and political support during the Vietnam War. But relations have cooled since Vietnam began embracing the west, embarking on a series of political and economic reforms and establishing ties with South Korea in 1992. Their economic relationship has also deteriorated. The international community imposed tough sanctions on North Korea following a series of weapons tests in recent years, and trade between the two countries is "small and inconsistent," according to Vietnam's foreign ministry. In a further test of relations between the two old comrades, a Vietnamese national said she was coerced by North Korean agents to carry out the assassination of Kim Jong Nam, leader Kim Jong Un's half brother, in Malaysia two years ago. In the rural province of Bac Giang, just outside Hanoi, a fading memorial for 14 North Korean air force personnel killed during the Vietnam War stands as a reminder of Pyongyang's contribution to the conflict. The memorial is tended by a North Vietnamese veteran, but seldom visited since the airmen's remains were repatriated in 2000. "Even though the state doesn't provide any support, I still look after the headstones because I also fought in the war," caretaker Duong Van Dau told Reuters. North Korea sent hundreds of pilots to fly MiG-17s in combat against American aircraft over North Vietnam, according to Vietnamese and North Korean state media. North Korean aircraft shot down 26 American planes during 1966-1969, a Vietnamese air force official quoted in the Vietnamese People's Police newspaper said. "We found them to be very brave. Their national pride was so high," Vietnam's former deputy defence minister and a former Vietnam War pilot Tran Hanh told Reuters. "They feared nothing, even death." Teams of North Korean psychological warfare specialists were also sent to help the North Vietnamese conduct propaganda and abduction operations directed against South Korean troops serving in South Vietnam, and Vietnamese guerrilla forces were trained in North Korea, South Korea's defence ministry says. North Korea's role in the war is now all but forgotten in Vietnam, however, save for the Bac Giang memorial. "I have a duty as a citizen to look after this site because it commemorates the fight against America with our North Korean brothers who fought alongside us and sacrificed themselves for our country," said Dau, the veteran caretaker. Relations between Vietnam and North Korea took a dark turn in 2017, when North Korean agents used Vietnamese citizen Doan Thi Huong to carry out the assassination of Kim Jong Un's half brother in a Malaysian airport. Kim Jong Nam was killed when Huong and Indonesian Siti Aisyah smeared the deadly VX nerve agent on his face. Both women have pleaded not guilty and told police they thought they were taking part in a hidden camera TV show. Both women face the death penalty if convicted. "She called us before Lunar New Year, asking about our health and for us to pray for her so that she can be freed," Huong's father Doan Van Thanh told Reuters. "I strongly believe that she will return, and that is also the wish of my family. I hope Kim Jong Un will help Huong to return home as soon as possible," Thanh said. 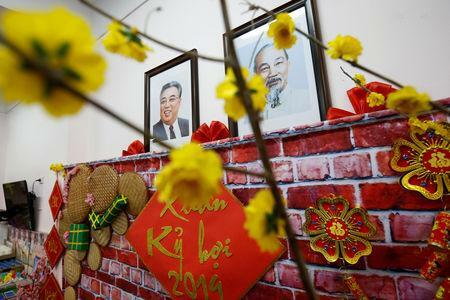 Some ties between the old socialist allies remain, and Vietnam's model of "doi moi" economic and political reforms from the 1980s and 1990s have been touted as a potential model for North Korea to follow if it wants to re-enter the international fold. There is some tourism from Vietnam to North Korea too. Nguyen Thuy, a businesswoman from Hanoi, visited North Korea for one week last November. "It must be one of the most peaceful places in the world since it hasn't received much influence from technology," Thuy said. 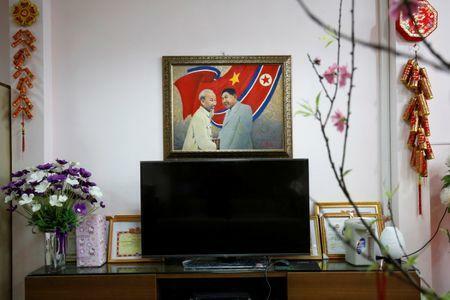 There are two North Korean restaurants in Hanoi, and a kindergarten gifted by Pyongyang that opened in 1978 is popular with North Korean diplomatic staff and locals alike. "Since its establishment, the kindergarten has always maintained a close relationship with the North Korean Embassy and with the Vietnam-DPRK Friendship Association," said Ngo Thi Minh Ha, head of the Vietnam-DPRK Kindergarten, speaking to Reuters beneath a painting of Kim Il Sung and Ho Chi Minh, North Korea and Vietnam's founding presidents, shaking hands. The school has opened two new classrooms named after Kim Il Sung and his son, Kim Jong Il, the father of current leader Kim Jong Un. 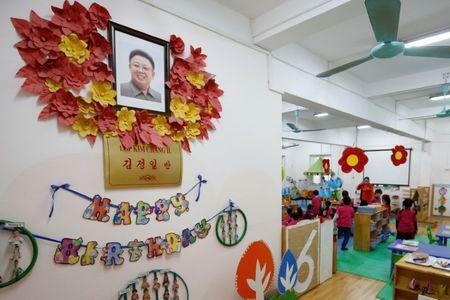 North Korea also runs a friendship kindergarten in Pyongyang that has a classroom named after Ho Chi Minh. "We totally believe (North Korea will further develop economically) because North Korean people are creative, strong-minded and determined," Ha told Reuters. "We believe our North Korean friends will have their own breakthrough 'doi moi' style reforms in the future."